Most species are adapted to long dry seasons for up to half the year, during which they lose their leaves and the plants resemble dry, dead twigs. Be patient! The plant will resume growth eventually, at which point you can resume watering as it approaches dryness, and regular application of fertilizer. Since the roots are totally exposed, the plant will dry out quickly, so this likely means watering at least daily. When the plant drops its leaves, stop watering again! Humidity in their natural habitat is 70-80% year-round. You can get by with somewhat less in cultivation, but that's what the plants prefer and they seem to care about it. They generally prefer intermediate light, about 2000 footcandles. 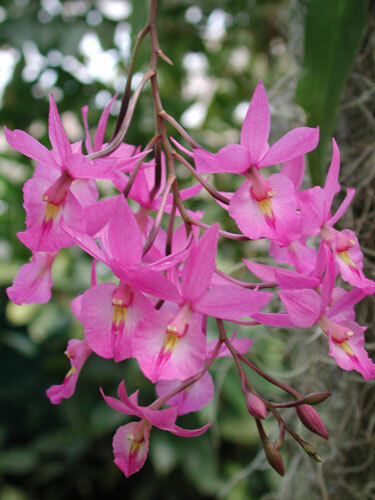 If you grow orchids indoors, this means a bright east window or a slightly-shaded south window, in the northern hemisphere. Intermediate temperatures work best, though they aren't particularly fussy. Try to provide daytime temperatures of 70-80°F (21-27C), cooling by about 15°F (8C) at night.